Borrego Palm Canyon is the third-largest palm oasis in California, and was the first site sought for a desert state park back in the 1920s. It’s a beautiful, well-watered oasis, tucked away in a rocky V-shaped gorge. The trail visits the first palm grove and a waterfall. A longer option takes you exploring farther up-canyon. In winter, the trail to the falls is one of the most popular in the park. In summer, you’ll have the oasis all to yourself. Watch for bighorn sheep, which frequently visit the canyon. 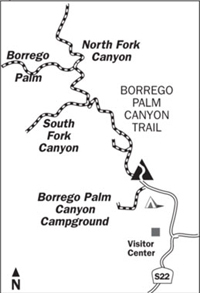 Directions to trailhead: The trail begins at Borrego Palm Canyon Campground, located one mile north of park headquarters. Trailhead parking is available at the west end of the campground near the campfire circle. The hike: Beginning at the pupfish pond, you walk up-canyon past many desert plants used by the Indians for food and shelter. Willow was used for home-building and bow-making; brittlebush and creosote were used for their healing qualities; honey, along with mesquite and beavertail cactus, was a food staple. You might also notice Indian grinding holes in the granite.